The hatchback body style adds versatility to the compact car class. Small hatchbacks are able to deliver sporty small car performance with an added element of versatility. 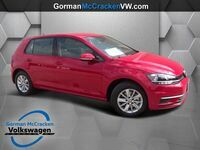 The 2018 Volkswagen Golf in Longview TX continues to lead the way in this competitive hatchback compact segment. Powering the 2018 Volkswagen Golf will be a 1.8-liter turbocharged four-cylinder engine. This engine produces 170 horsepower and 199 pound-feet of torque. Fuel economy ratings check in at up to 25 miles per gallon in the city and 36 miles per gallon on the highways. Transmission options include a five-speed manual and a six-speed automatic. Volkswagen offers the 2018 Golf in two trim levels with a variety of features and technology systems. The car is available in S and SE models. Each trim offers a different collection of comfort, safety, interior and exterior features. Multiple safety and driver assistance features are offered on the 2018 Golf. Standard and available safety and driver assistance features include six airbags, three-channel ABS with electronic brake pressure distribution, a rearview camera, Intelligent Crash Response, Forward Collision Warning and Autonomous Emergency Braking with Pedestrian Monitoring (Front Assist), Blind Spot Monitor with Rear Traffic Alert and Volkswagen’s Post Collision Braking System. Post Collision Braking automatically applies the brakes when the system detects a collision to minimize further damage. The Intelligent Crash Response automatically shuts down the car’s fuel pump, unlocks the doors and switches on the hazard lights. Additional comfort and technology features offered on the 2018 Volkswagen Golf include: 8-inch touchscreen infotainment system, steering-wheel-mounted paddle shifters, V-Tex leatherette seating surfaces, KESSEY keyless access with push-button start, heated front seats, voice control, LED daytime running lights and LED taillights. The hatchback body style of the 2018 Volkswagen Golf allows the car to offer increased versatility and storage potential. The car offers 16.5 cubic feet of cargo space.